The parish of Garboldisham is located on the Norfolk/Suffolk border, roughly halfway between Thetford and Diss. The village is a linear settlement strung out along the B1111 and adjacent roads. The southernmost parts of it are known as Garboldisham Common and Smallworth and there are several isolated farms elsewhere. The River Great Ouse forms part of the southern parish boundary and is fringed by low-lying marshes. Garboldisham has seen a limited amount of archaeological work. There have been a few excavations and a good number of site visits. Stray finds have been collected and some fieldwalking and metal detecting have taken place. Sites have been identified in most parts of the parish, with most artefacts gathered in a central strip aligned north to south through the centre. Although conclusions can be drawn about past settlement and activity, the concentration of finds means that these cannot be entirely comprehensive. Prehistoric flint artefacts have been found on a good number of sites. Although some cannot be dated any more closely than the prehistoric period in general, many can. These include Palaeolithic flint artefacts (NHER 28108), Mesolithic flakes and cores (NHER 10874), a Neolithic arrowhead, a Neolithic polished axehead and a Neolithic laurel leaf. A Neolithic or Bronze Age stone axehammer, a stone macehead, a Bronze Age copper alloy rapier and a piece of antler decorated with incised spirals have also been found. There was a Bronze Age barrow cemetery on Garboldisham Heath. One round barrow survives (NHER 6112), one has been destroyed (NHER 6113) and two possible round barrows are recorded (NHER 10290 and 14423). The surviving barrow is known locally as 'Soldier's Hill' and 'Boadicea's Grave', although there is no evidence that Boadicea (Boudica) was buried here (see also NHER 10785). It was excavated in 1963 and a complete Bronze Age urn containing cremated bone was discovered. A cropmark (NHER 14423) enclosure close to one of the possible barrows may have been contemporary with it. Another round barrow (NHER 6114) survives about a kilometre north of the cemetery. Iron Age pottery has been found at sites close to the village and one of the sites has yielded a horse harness pendant or fitting (NHER 31682). In 1980 a gold Iron Age torc (NHER 23472) was sold at Christies in London. It was once held in a collection at Garboldisham and may have been found in the parish, although this is uncertain. Metal detecting and fieldwalking have led to the discovery of numerous Roman objects at a site north of the village (NHER 40259). These include pottery, tiles, coins and a cosmetic pestle, and together they suggest the site of a possible settlement. Roman pottery, coins and metalwork have also been found at a number of other sites. Devil’s Ditch (NHER 6115) is a possible Early Saxon boundary. It survives as sections of ditch and bank, with its southern end located close to the River Ouse and its northern part in Harling parish. The Garboldisham/Riddlesworth and Garboldisham/Harling parish boundaries follow its line. It could have been a defensive feature, although it is more probable that it marked a boundary between territories or estates. During the 1940s part of a shield and bones were found close to Devil’s Ditch and it is possible that they came from an Early Saxon inhumation burial. The only definite Early Saxon object found to date is a 6th century AD cruciform brooch. Two 9th century coins (NHER 18615 and 33177) have been discovered. One is a penny of King Athelstan I of East Anglia (AD 827 to 841). The other is Carolingian. Late Saxon pottery has been found at a site in the north of the village. Garboldisham appears in the Domesday Book of 1086 as ‘Gerbodesham’. This is an Old English name meaning ‘Gaerbald’s homestead or village’. In 1086 King William I held the manor and freemen, smallholders, slaves, ploughs, meadow and pigs were recorded. A vill called ‘Wica’ was also in existence. It was situated in Garboldisham parish, was held by Hugh of Montfort and had freemen, villagers, smallholders, slaves, ploughs, meadow, woodland, pigs, sheep and cattle. A possible moat (NHER 10881) in the east could indicate its location. Two other medieval moats have been identified. In the north, a few small sections of a moat survive as earthworks at Uphall. The rest was destroyed during landscaping. It is possible that a cropmark visible on aerial photographs in the south of the village could be a moated site. In 2000 evidence for medieval ridge and furrow and possible medieval pits were discovered during a watching brief on Back Street (NHER 35180). There are two medieval churches. Sections of St John the Baptist’s church (NHER 5570) date to the 13th and 14th centuries. The tower was built in the mid 15th century, probably by master masons based in North Lopham, and much of the building was rebuilt in 1862. Only the 14th century tower of All Saints’ (NHER 5573) survives, the rest of the church having been demolished in 1734. Jacques (NHER 5572) is a farmhouse that was built around 1490 and altered during the post medieval period. 15th century features survive inside and an excavation in 2002 revealed medieval floor surfaces and medieval pottery. Breckland House (NHER 5569) was also built during the late 15th century. It is timber framed, has a two storey stair turret and the exterior plasterwork is probably 18th century. Pear Tree Cottage/Compton (NHER 22700) was constructed in the late medieval or early post medieval period as a hall house, before being divided into two properties during the 18th or 19th centuries. Uphall Farmhouse (NHER 10880) was built in the late medieval period as a hall house, was altered in the 17th and 19th centuries and was demolished in the late 1960s. 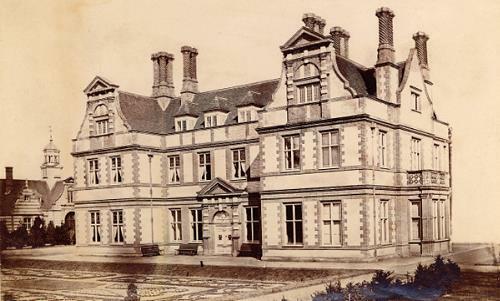 Garboldisham Manor, a post medieval manor complex completed by George Gilbert Scott junior in 1873. © Courtesy of <?xml:namespace prefix = st1 ns = "urn:schemas-microsoft-com:office:smarttags" />Norfolk County Council Library and Information Service. Post medieval buildings include The Old Manor, Garboldisham Manor, Manor Cottage and the Grange. The Old Manor was built in the 16th century, is timber framed and has panelling dating to about 1800. The Hall (NHER 5574) was probably built during the 18th century and burnt down in 1955. A modern house now stands on its site and the surviving cellars are used as outbuildings. An associated stable block may have originally been built as a barn in the 15th, 16th or 17th centuries, before it was converted to stables during the 18th century. A 1930s dovecote and horse training ring by Lancelot Smith are also on the site. In the south of the village is a mid 18th century post mill (NHER 10883). 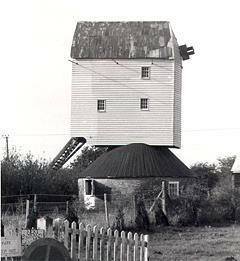 It fell out of use in 1917 and was restored during the late 1970s. To the south is the site of an 18th century windmill and to the north is the site of a 19th century windmill. There was a post medieval watermill and a post medieval saw pit in the village. During the Cold War there were two Royal Observer Corps sites in the west. An Orlit post was built at the most southern site (NHER 16624). David Robertson, 1 March 2006.
http://www.norfolkchurches.co.uk/garboldisham2/garboldisham2.htm. Accessed 1 March 2006.
http://www.norfolkchurches.co.uk/garboldisham1/garboldisham1.htm. Accessed 1 March 2006.
http://www.norfolkmills.co.uk/Windmills/garboldisham-postmill.html. Accessed 1 March 2006.